British brand Atkinsons has launched Jasmine in Tangerine, a new addition to their Contemporary Collection. Jasmine is steeped in the floral language of love and passion. Just as Lord Krishna brought the jasmine tree from heaven for his beloved wife Rukmini, Sir Thomas Milington, the noted 18th Century English Physician and adventurer, brought back the purest jasmine flower from India as an act of Love to England. Jasmine in Tangerine is a contemporary tribute to this romantic expedition. It is a radically impertinent take on Jasmine that marries with a charming irreverence the exotic solar beauty of the Indian flower and the sparkling suavity of a tangerine squeeze, a fruit delicacy exclusively enjoyed by the Royal Society in the 1800s. 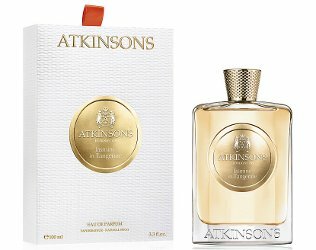 Atkinsons Jasmine in Tangerine is available now at Harrods in the UK, 100 ml Eau de Parfum, £115. Update: Jasmine in Tangerine was developed by perfumer Céline Barel; additional notes include pink pepper, ylang ylang, osmanthus, vanilla and white cedar. I really like the name and the scent of tangerines. White florals are not my thing, though. And mine:). Well, jasmine is anyway! And do love me some tangerine. I’d love to sniff this:). I wish I was near Harrods. U.K. is so lucky. I like more than jasmine for wfs, forgot about a couple. Gardenia isn’t one of them though, even if soaked with tangerine juice:). Kindcrow – I’m with you! I know jasmine and citrus aren’t that unusual as far as note pairings go, but I can’t recall jasmine with tangerine. That sounds really pretty. There are certainly plenty of perfumes with both mandarin and jasmine, but offhand can’t think of another with both in the name.